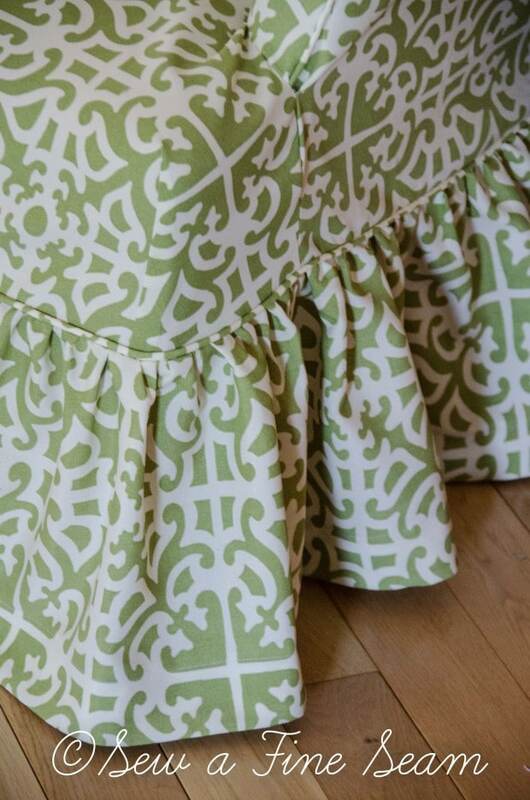 I think piping can be a fun detail and add a sophisticated touch to a sewing project. 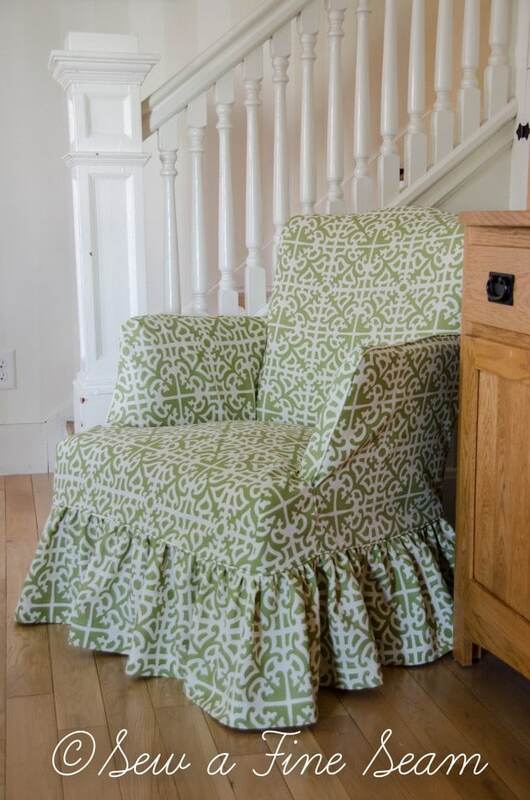 Piping can match the fabric used for the project or it can be a contrasting fabric for a pop of color or a bit of fun. And you are not limited to the piping sold in stores. You can make your own! 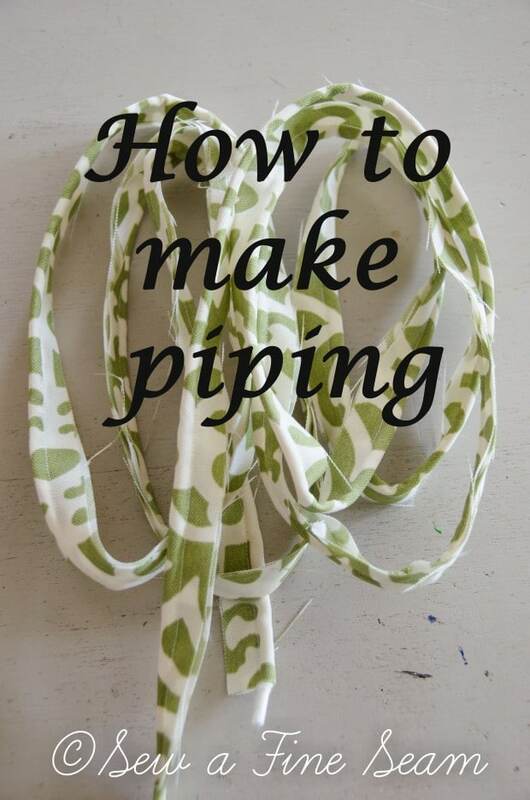 I’ll show you how to make piping – it’s really quite easy. This chair that I recently slipcovered has piping that matches the chair. 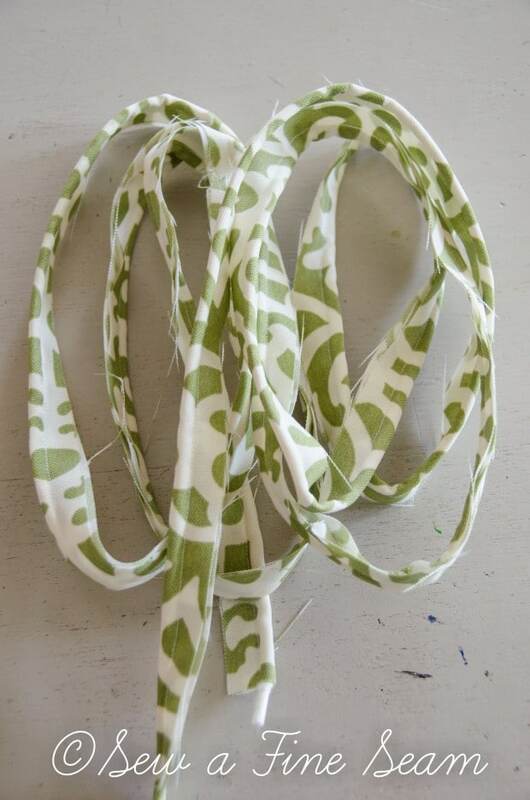 I made the piping using the same fabric as the chair and cording that I bought at Jo-Anns. 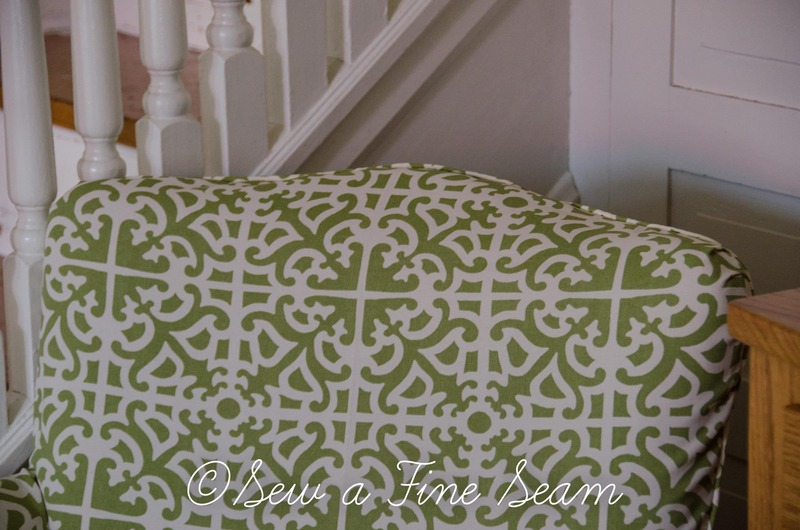 You can figure how much piping you will need to make by measuring along the lines of the chair, pillow, or whatever you are adding piping to. 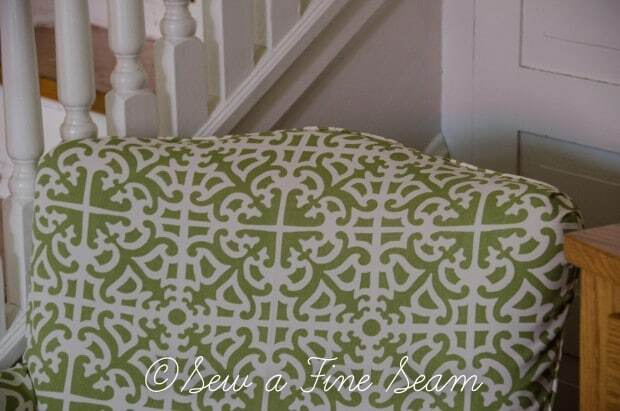 Just measure all the areas that get piping and then add a few inches so you have plenty to work with. My cording is regular sized and comes in a package of six yards. 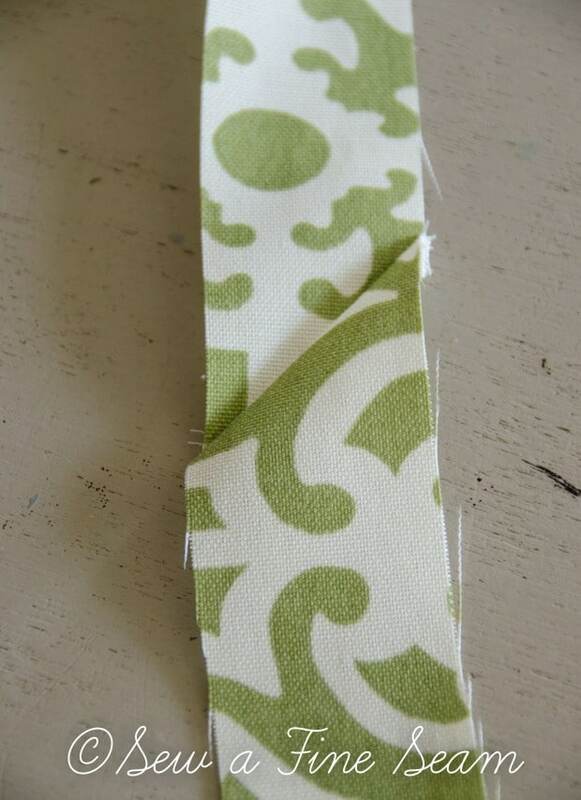 I cut my fabric strips 1 1/2 inches wide. And I have a secret to share! I DID NOT cut my strips on the bias 😀 Most places you go looking for instructions on making piping are going to tell you to cut your fabric on the bias. And if you have ever tried cutting out fabric on the bias you know that it is a royal pain. 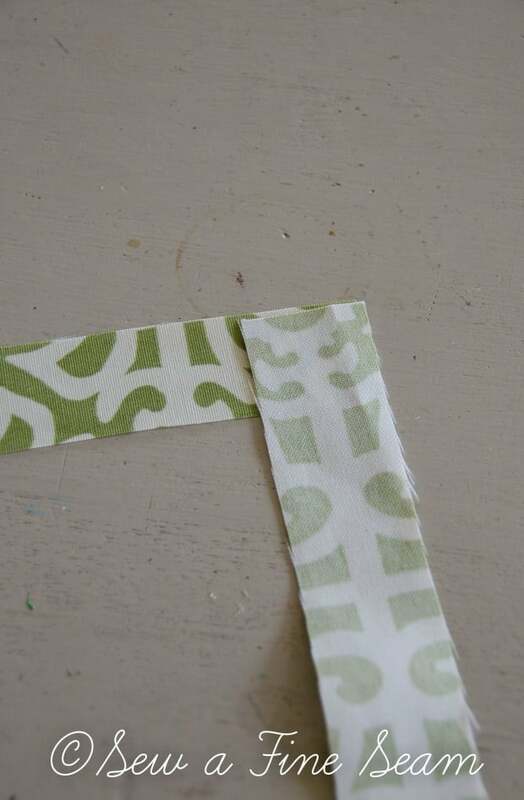 So I skip that little detail and just cut my strips of fabric along the straight grain line. It works just fine. I’ve made piping this way many times and never had a problem. 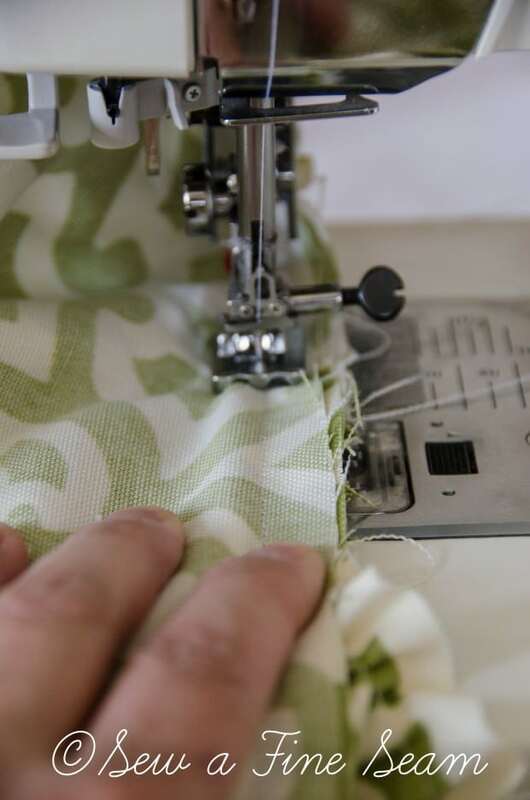 You will most likely need more piping than the length of one strip of fabric. You can just sew the pieces together straight across or you can make a mitered seam if you prefer. I make mitered seams because I think it makes it look a bit more professional. 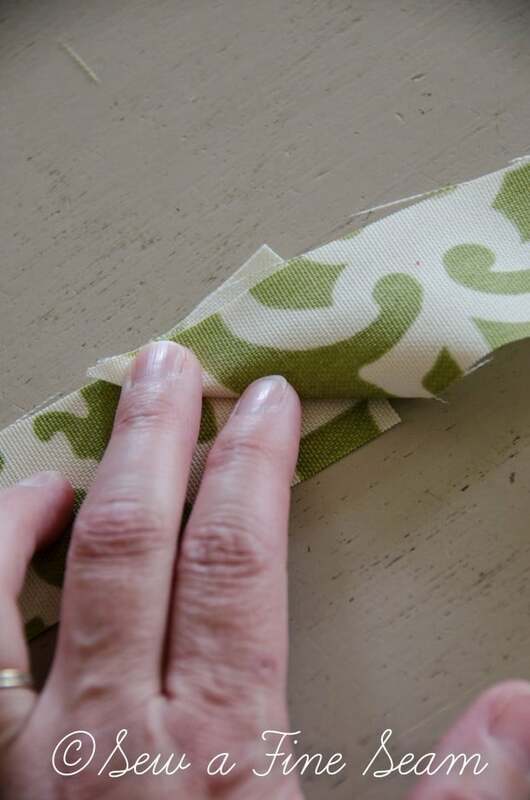 You will lay two fabric strips together as shown in the photo. You want the pieces to turn like this when you have the seam sewn. It is important to make the seam across the right diagonal. Start at the top of the piece that is wrong side up and sew diagonally to the underneath strips corner. 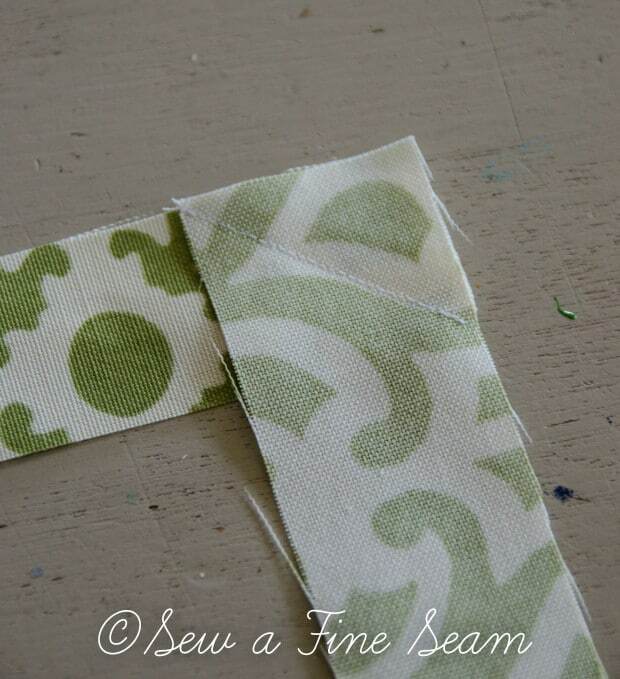 Sew exactly from corner to corner or the strips will not line up properly. After the seam is sewn it should open up like this. 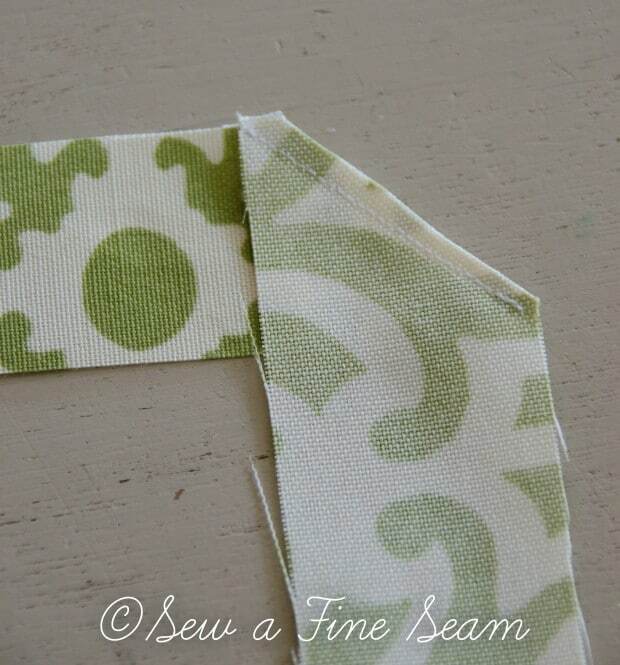 If you sew the wrong diagonal you will not have a continuous strip going all one direction! 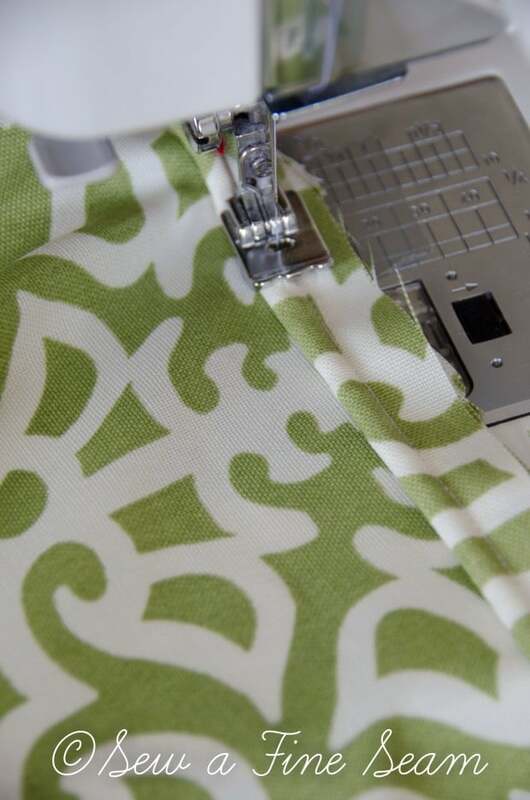 Press the seam and you now have a much longer piece of fabric for making your piping. 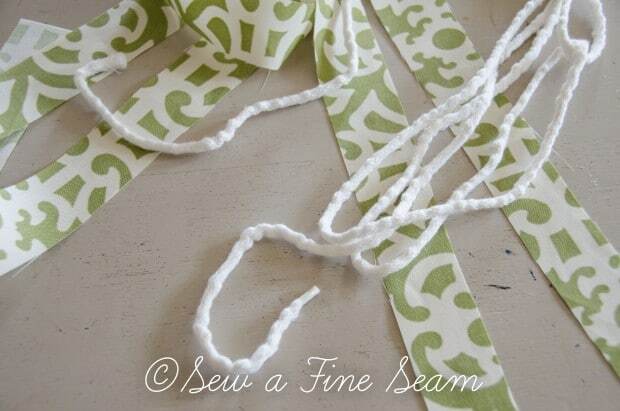 Add more fabric strips to make the length you need. 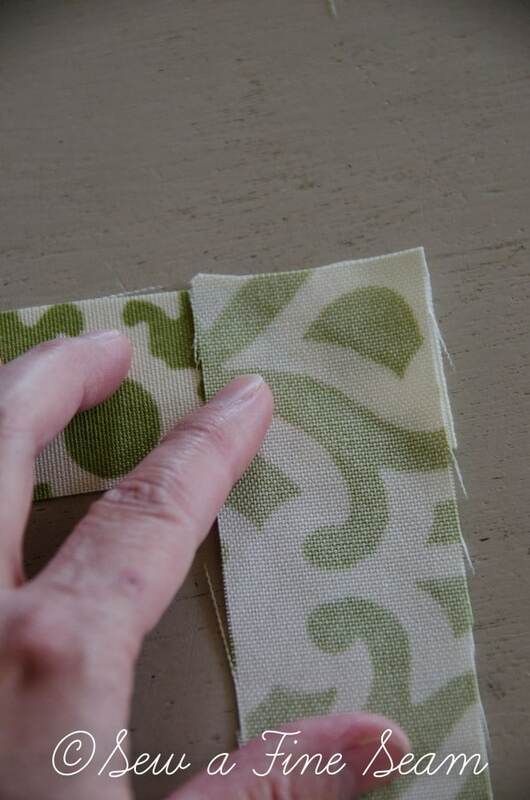 Now it’s time to enclose your cording inside the fabric strip to create your piping. I have a piping foot for my machine. This foot cost around $10 and if you are making piping I would highly recommend you get a piping foot for your machine. 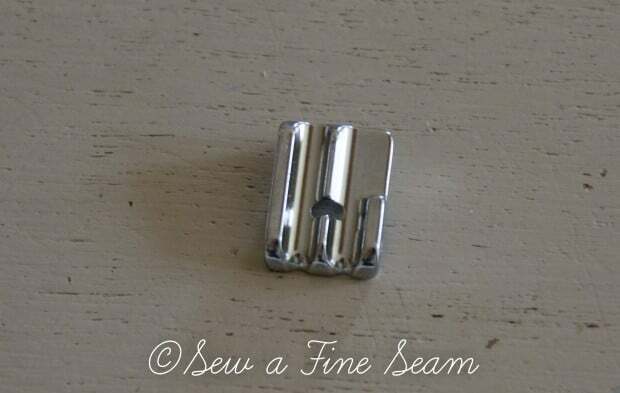 If you do not have a piping foot and you want to make piping without getting one or simply don’t have the patience to wait till you get one you can use your zipper foot to make your piping. I have made piping that way and it can be done. I, however, am not very good at going slowly when sewing and when using a zipper foot for piping you do have to go a bit slower as it takes some effort to make the piping come out just right. This is the bottom side of my piping foot. 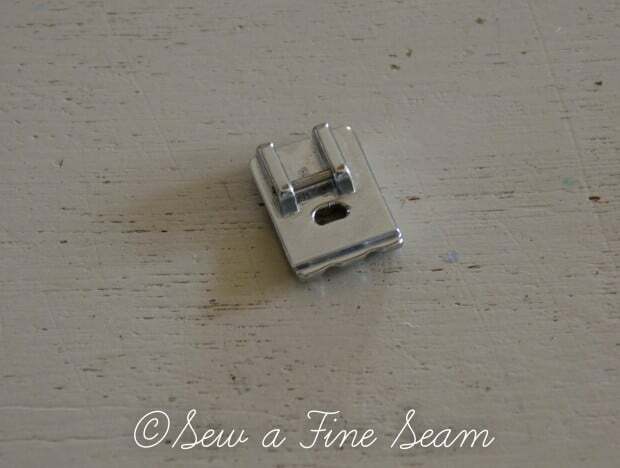 It has grooves that the cording can fit up in as you sew and it keeps the stitching exactly where it should be. 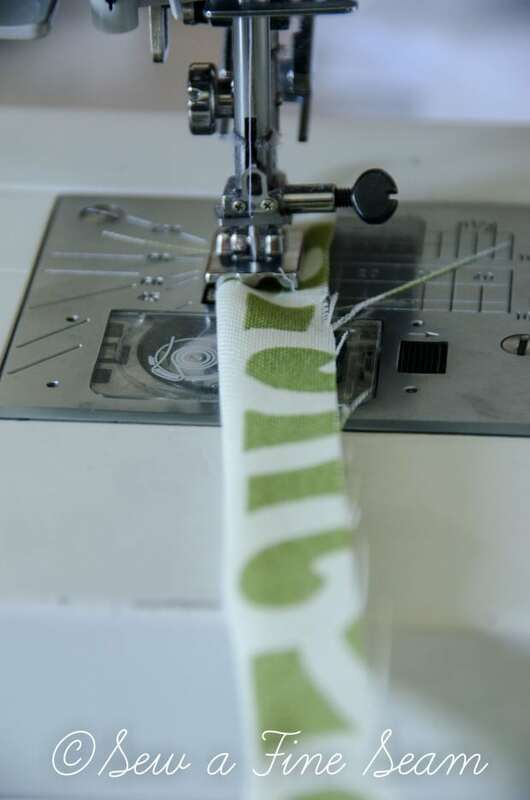 If you use a zipper foot you will have to guide the fabric and cording through as closely as needed to create nice looking piping but not so close that you sew into the cording. 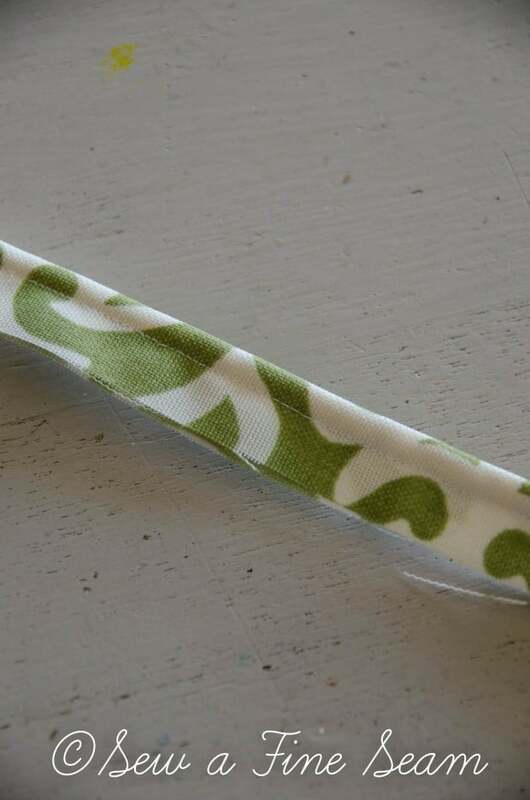 Encase the cording in the fabric, place the fabric-covered cord into the groove of the piping foot and stitch. 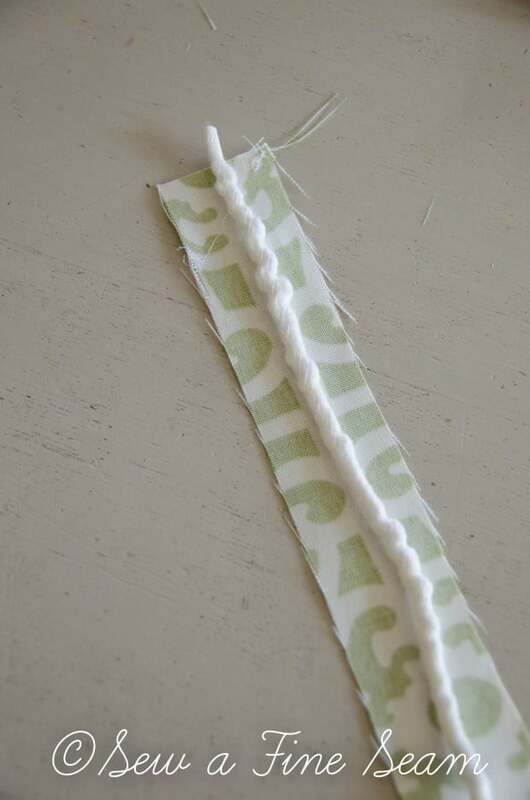 If using a zipper foot stitch as closely to the cording as you can without sewing into the cording. 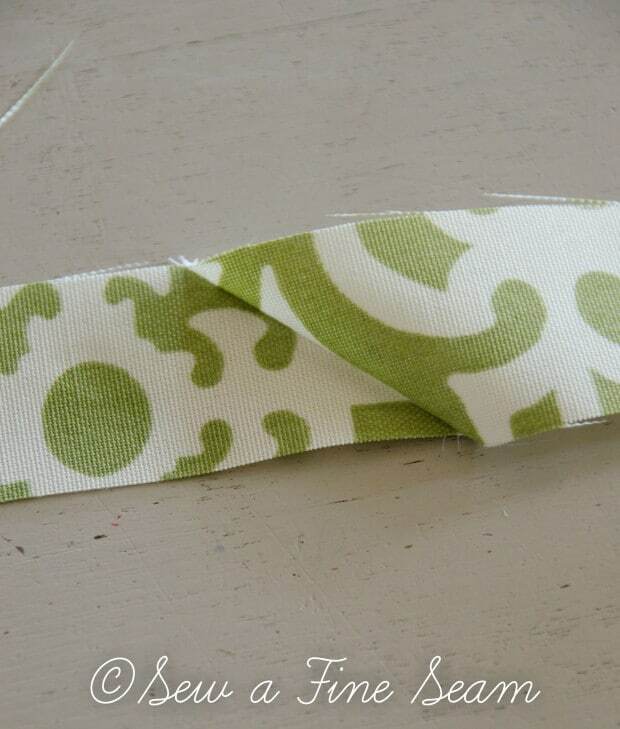 Work the cording into the center of the fabric strip tightly as you sew. This is what your finished cording should look like. Now you are ready to add it to your project! 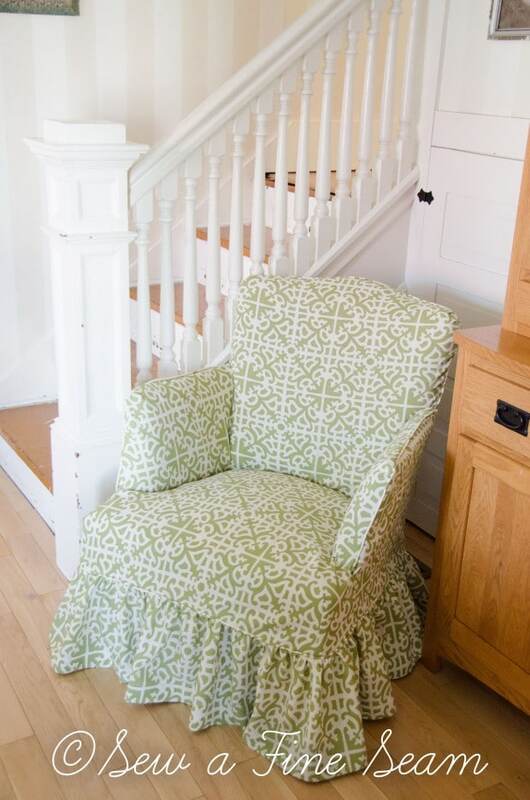 For the ruffle of the chair I slipcovered I added the piping to the chair piece first. You don’t have to sew it on first, you can sandwich it between two layers and sew the seam at the same time. Since I was adding a ruffle and the fabric was a bit heavier and stiff I sewed the piping on first. I lined up the raw edges of the piping with the raw edge of the chair piece and stitched, using my piping foot again to keep the stitches exactly where they needed to be. And added the ruffle. Raw edges and right sides together, piping sandwiched between I stitched my seam, using my piping foot again. 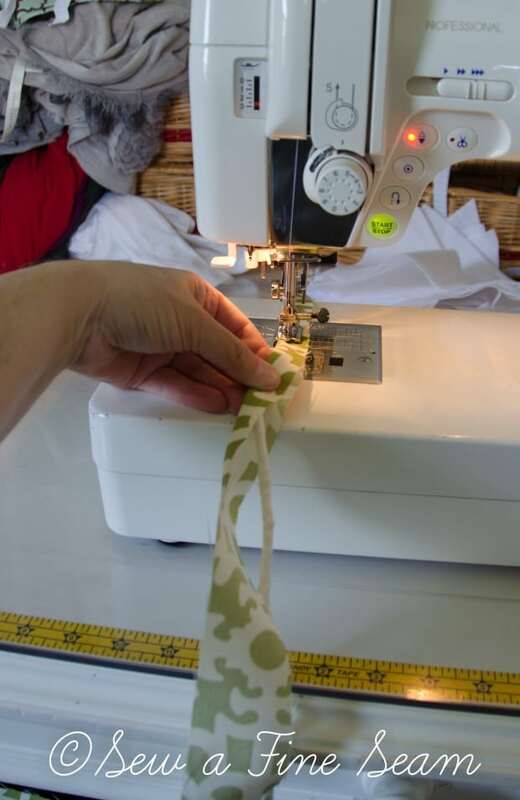 It’s harder to keep the cording right in the groove of the piping foot when sewing a seam with the piping between but it is much easier than with a zipper foot. Even with heavier fabric you can see the cording and keep it straight. See the cording making a bump under the fabric? You can keep the groove of the piping foot right along that ridge and you piping will turn out perfect! I added piping along the top and down the sides of this chair. Beautiful job…and you are a great teacher! I’m a novice and I understood your directions. Thanks! Thanks so much Cheryl – it’s nice to know my instructions are understandable! Sometimes it’s hard to know for sure if I’m saying it right and explaining in a way that can be figured out! I had no idea how much easier a piping foot would make! I will be getting one ASAP. Thanks so much for the info! You are most welcome Cathy! It makes a world of difference when making piping to use a piping foot – hope you got one! Your tutorial is excellent, thanks so much Jill. I have to learn to make piping if I’m going to make things look better. All the steps and how-to’s/photos you included are perfect, I could get it. I’ll save it now so I can print it out when I get a color cartridge. Could only afford the black this month so having to print everything out in black, works for me. Love how you showed us so well what to do. I’ll have to look for a piping foot. Think I have a zipper foot but no idea how to use it either. Might as well buy piping foot. I haven’t put a zipper in anything for years. Thanks Jane Ellen, I hope if you want to add piping to things you will be able to use my tutorial! If you need to ask questions please do! Also – you don’t have to use piping to make things look nice! I didn’t add it to any of my own slipcovers simply because I didn’t want to take the time! OK – I want to go buy a piping foot and I have never piped and probably never will! It looks so easy & fun when YOU sew! Have a fun weekend at the flea! Haha Melanie you gave me a chuckle! 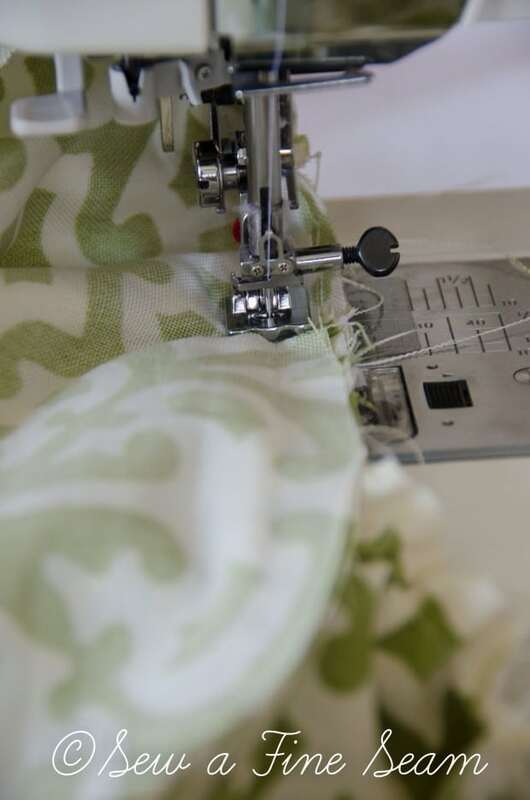 I think sewing is fun – most of the time! And most of it is easy – I’ve been doing this for 30 years! But if you don’t enjoy it then do what you DO enjoy! Wow ~ you are amazing. 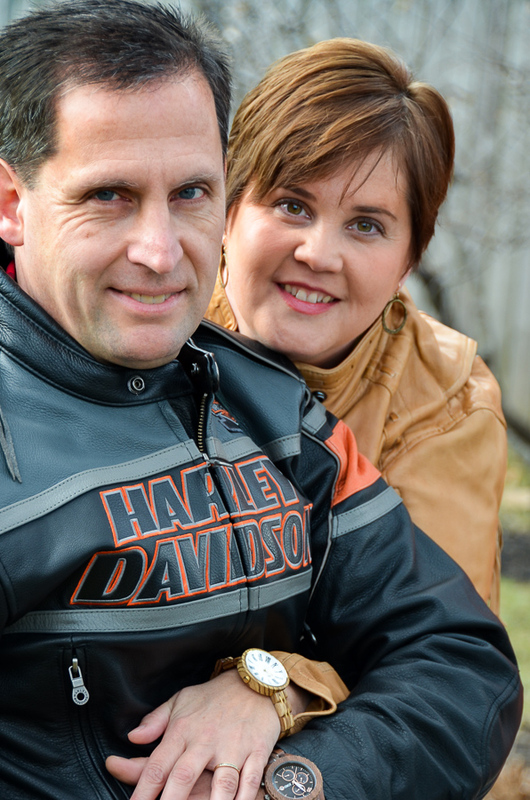 Thanks Carla – Piping doesn’t have to be as hard as it seems like when thinking about it! 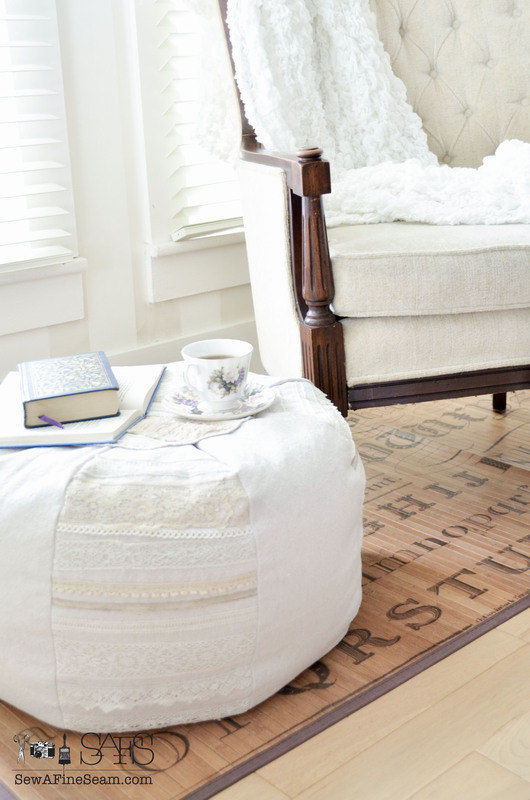 My hubby likes the look but I never make myself add it to my own slipcovers! HA! I’m too lazy and always think it takes so much more time but it really isn’t that bad! Laughing at your comment, “I am not very good at going slowly when sewing.” I can attest to that! You are fast geared completely unlike your mother. 🙂 I just wasn’t created to go slow! Geared like my Grandpa King I guess!